Click here to read Equitrekking's Blog entitled Mexico Horseback Riding Photo Journey, from Nov. 23, 2014. Click here to read Men's Journal's expert advice on the Best New Dude Ranches for the 21st Century. 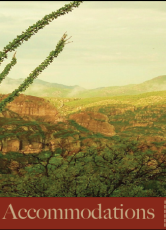 Click here to read Riding Mexico's Wild Frontier, an August 2013 article about the Rancho in the US monthly Men's Journal. Click here to read Riding With the Cowboys on a Mexico Ranch, a January 12, 2013 article about the Rancho in the UK daily The Guardian. Click here to read April 23, 2012 article about our ranch from the UK daily The Telegraph. Click here to read Equitrekking's July 7, 2013, article naming us as one of the three best wilderness ranches. Articles Written About Us Red Deer Advocate See the Southwest Tracks and Trails Trip Advisor Reviews Testimonials Page Get Yours! International Lifestyle Magazine has written a feature article on us in their December 2010 edition (Issue 26). Of course we highly recommend you reading it. Click on the link below, which will take you to Issue 26, select Issue 26 (cover photo: gymnast on elbows), go to the bottom left corner and type (page) 20 which is the page where the article starts. Enjoy. by phone, instant chat or email.